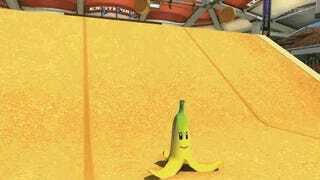 Mario Kart 8 got some new stuff today in a DLC update. The thing we were all most excited for, by far, was getting to play as Link in Mario Kart. A little too excited, by the looks of it. The predictions were all too real. 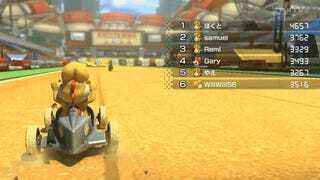 Once I logged into Mario Kart 8's online versus mode, everywhere I looked there was another Link. In front of you. To the left. To the right. Look behind you, and there he is again. Here a Link, there a Link. Everywhere a Link Link. Too many Links makes Yellow Yoshi cry. But the thing is, who doesn't want to play as Link right now? I'll admit, I bought into the hype. It's like we're all jostling over who gets to use the best controller, and who's gonna get stuck with a Wiimote. Except the controller is Link. Which is sort of disturbing to think about, actually. Link is primarily the protagonist of epic-length single player adventure games, and there's a reason for that. His identity is perfectly designed to mesh gracefully with a single player's personal identity. "The gang of dead-eyed heroes." Wow. That is not an image I want to associate with Link, for sure. I can't come out and proclaim: Don't Link and drive. Nobody can. But let's all remember to Link in moderation. Lead image via Simon Parkin.